Art is Fun! Play the Inquisition on January 7th! For those of you who are fans of the National Public Radio news quiz Wait Wait, Don’t Tell Me, then the Walker’s new quiz forum The Inquisition is for you. No, we will not be providing Carl Kasell’s voice on your answering machine, and no, Mo Rocca won’t be accepting any V-Neck sweaters as a rebuttal. But… you will walk away with a sense of pride that you might know more than art experts! Or, at least think you do. What is the inquisition, you may ask? Well, it’s an old Walker program from back in the day. And by back in the day, I mean 1940 back in the day. Before then, the Walker was a private gallery with a staff of three until the Works Progress Administration came along and made it into a public art center. The rest is history…. Until this attempt to revive this short lived public program created after the new Walker opened. 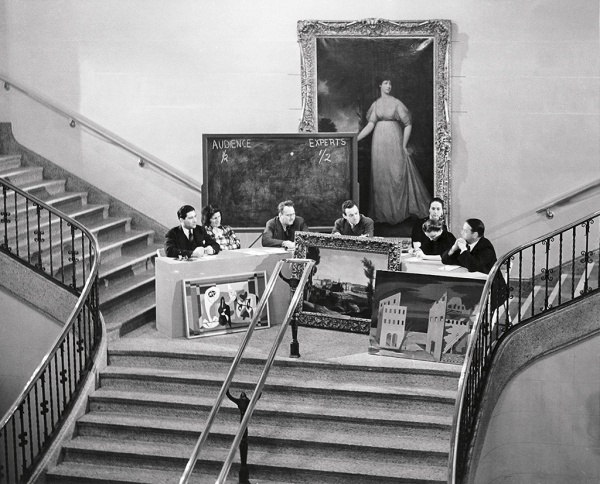 We will be accepting questions from you, the Walker museum visitor for a segment of the game called, “The Audience Wants to Know.” That’s where you can ask those tough art questions you’ve always wanted to know the answer to, or find out a piece of Walker trivia. Simply click on this link to submit your question. Making things sound funny is hard! For some inspiration, I turned to the game show experts at National Public Radio. What could be more funny than real life (I guess that’s why reality TV is so popular!) I managed to snag an interview with Wait Wait, Don’t Tell Me writer Ian Chillag. Each week, he and his team at NPR mine the endless cycle of news in order to bring you this popular game show. Here’s what he had to say. How did you come to work for NPR and the Wait Wait show? I’ve worked all over public radio, producing Fresh Air for several years, working on the now-defunct Bryant Park Project, and doing some freelance reporting. Along the way I figured out I’m not quite serious enough for news, where they place a weird priority on things like “getting facts correct” and “not screwing up,” so I’m very happy to have ended up at Wait, Wait, where that’s not a concern. How hard is it to write questions for a quiz show and do you look to game shows of the past for inspiration? For us, it’s really just a matter of reading a story and finding it funny or not. I guess I shouldn’t make it sound so simple or they’ll figure out they can replace me with a monkey. We do spend a lot of time trawling the internet, trying to find stories that are going to surprise people, or trying to find a unique and funny angle on a story that’s dominating the media. Since a large part of what we do follows what happens in politics, it gets difficult for us when we have one of those rare weeks when politicians don’t behave badly. Why do you think people play, watch, or root for people on a game show? There are so many game shows where someone’s life can be changed by the prizes, and that makes good, tense TV. In our case, it’s a bit different because as Peter says, our prize—Carl Kasell’s voice on your home answering machine—is both priceless and worthless. How smart do you have to be to play a game show, or is it really about that? I couldn’t win Jeopardy. In fact, I can’t even spell “jeopardy.” I always switch the “o” and the “a” and have to change it. But anyway, I could probably get lucky and win Deal or No Deal. They’re all so different. For us, it’s more about the fun of playing the game than winning or losing it, but on the off chance any former contestants are reading this, I’ll say everyone who plays on Wait, Wait is Mensa caliber. What’s a memorable experience you’ve had while working on Wait Wait, Don’t Tell Me? Thanks Ian! And for all of you reading this post, don’t forget to come to the Inquisition. The first one is January 7th and our guest experts will be MPR’s arts correspondent Marianne Combs and artist Andy Sturdevant.